First thing first, I am very disappointed that the Socialists running the country did so little on renewable energy sources during their mandate. After all, they are allied to the Greens, who should be adamant on renewables and energy efficiency. 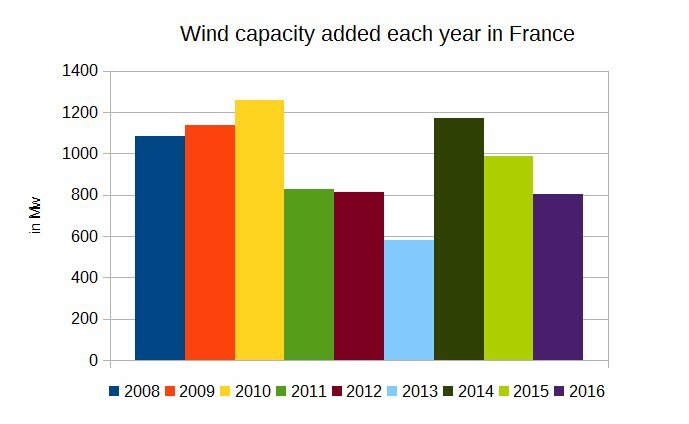 There were 11.6 GW of wind capacity in September 2016, which produced 21 TWh in 2015. The target capacity for 2018 is of 15 GW. Wind power currently employs a little less than 15,000 people. To compare with neighbouring countries, Germany has 45 GW of capacity installed, Spain 23 GW and the UK 13.8 GW. Hydro is France’s main renewable energy source and has been for years. It has 25,5 GW of installed capacity and produced 58.7 TWh in 2015. It has been producing from nine to 14 percent of the country’s electricity for the past few years. 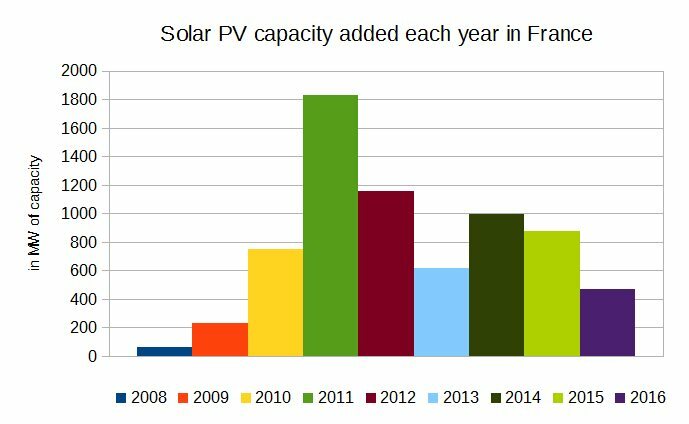 For solar PV, the installed capacity in September 2016 was of 7 GW, which produced 7.7 TWh. The governmental target for 2018 is 10.2 GW. The sector has 8,230 direct jobs (compared to a massive 32,000 in 2010-2011… or 12,000 in 2012). To compare, Germany is first with 39.7 GW of installed capacity, Italy second with 19 GW, the United Kingdom third with 8.5 GW. France thus comes fourth there as well. I am not sure we should cover roads with solar panels. The world has it is already has a lot of potential if we were covering the buildings of all kinds with solar PV panels. Then, we have at our disposal so many other efficient technologies such as LED light bulbs or other renewables such as wind power and so many others.